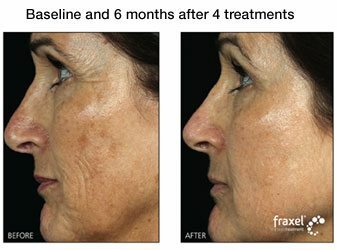 Fractional lasers help remove layers of skin tissue to help reduce fine lines, wrinkles, scars, uneven coloration, skin laxity, textural irregularities, dull tone, age-spots, sun freckles, and liver spots. Technique is also very important when administering treatment with a fractional laser. The treatment area is divided into sections where columns of skin are removed, while leaving the surrounding skin intact to aid in the skin’s natural healing process. Fractional lasers are categorized as a ‘more aggressive’ form of treatment because the results of one session generally are better than those after multiple sessions of other non-invasive anti-aging treatments. To ensure patient comfort during a fractional laser treatments, we apply a local, sometimes topical, anesthetic to the treatment area. The treatment area may look and feel like a sunburn for the next day or so. Typically, one fractional laser treatment session is needed to reach optimal results. Although in sensitive areas that cannot be treated aggressively, more than one treatment may be needed to reach optimal results. Scheduling of maintenance treatments will vary, but can last longer if sun is avoided and proper skin care used.